MMC3. Nintendo's most popular mapper chip. It comes in MMC3A, B, and C revisions. The difference is probably something minor like process size. The MMC3 contains 8 registers. 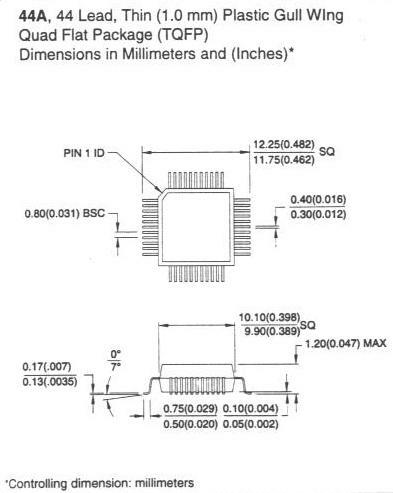 The chip uses A0, A13, A14, and A15 for decoding. Each register is 8 bits wide, though all bits may not be used. Registers are: 8000h, 8001h, A000h, A001h, C000h, C001h, E000h, and E001h (excluding mirrors). the mapping, IRQs, and WRAM write disable. Register 8000h is the "control" register, while 8001h is the "data" register. First, a byte is written into 8000h to select the desired bank register(s). Then, the desired bank number can be written into 8001h. C: CHR Address Invert. When set, does an effective XOR of 1000h with the CHR addresses. S: PRG ROM swapping control. 0 - 8000-9FFFh and A000-BFFFh can be swapped out while C000-FFFFh is fixed. 1 - A000-BFFFh and C000-DFFFh can be swapped out while 8000-9FFFh is fixed. E000-FFFF is always fixed to the last bank of ROM. When S = 0, C000-DFFF will contain the second to last bank of ROM. When S = 1, 8000-9FFF will contain the second to last bank of ROM. Data register for the desired bank#. 1 - Enable WRAM... if present, it is mapped in 6000-7FFFh. 1 - WRAM is readable, but writes do not proceed. All registers below relate to the interrupts only. is written to. The value written to C001h is irrelevant. the IRQ flag. The value written is irrelevant. the counter on every RISING EDGE it makes. on the PPU bus toggles. * THERE IS NO DIRECT ACCESS to the IRQ counter! flag flip-flop. The IRQ counter is unaffected. reloads, it will use the new value written. value. 2 to 256 scanlines are supported. C000h results in it firing an interrupt after the new count expires. set! If both of these bits are clear, the IRQ counter will not count no way no how!!! erratically on your MMC3. Don't count on this effect occuring. set, the counter will decrement properly if the PPU address is manually manipulated. like Megaman 6 and Pinbot use this so emulating properly is important for these games to work. after the counter reaches 00h, and thus fires). NES-TKROM - Max. 512K PRG, 256K CHR, 8K WRAM, Battery-backed. NES-TSROM - Max. 512K PRG, 256K CHR, 8K WRAM, Non-battery-backed. to deglitch it for the IRQ counter.